The photographer Amy in my studio today, I loved her dress! Table cloths from the Art Party at NGV have turned into wall hangings! As usual, photos are in order from newest to oldest. 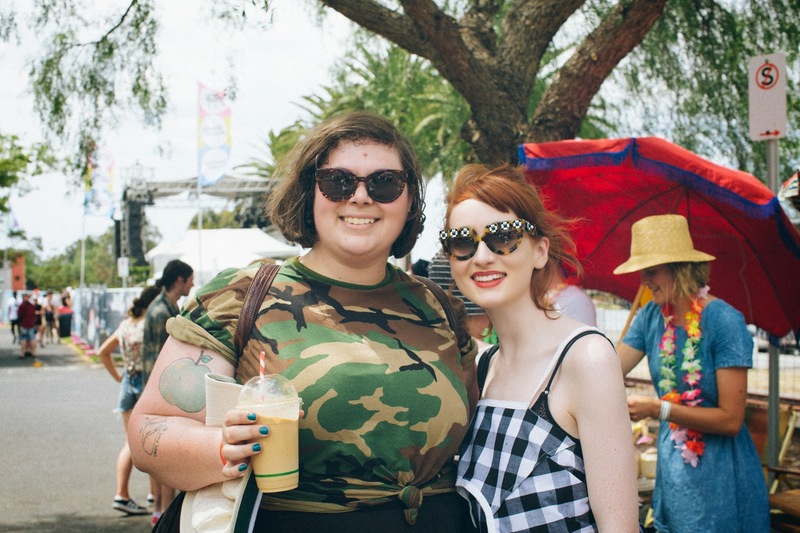 I realised when I put these photos up that the last 'day off' I had was when I went to Laneway music festival which was 10 days ago and I'm not going to have another day off until this coming Sunday. I'm not complaining, but I'm just realising that it's not sustainable. I was so unbelievably tired today that I felt myself falling asleep at my desk. I've just been working towards deadlines and the more I think about deadlines the more I realise what an unpleasant turn of phrase it is... literally a DEAD line. And the more I think about how unpleasant I find the phrase the more the work I have to do to meet the "deadline" seems looming and large and unmoving. However, if I didn't have scary deadlines I'd probably never get myself together and actually relinquish my work to the realms over the finish line and spend forever nit picking and carefully crafting sentences until they combust. At the moment I'm working on a section of the writing for my book and I'm finding it rather hard. I can write, but I'm used to coming online and writing at odd intervals when it takes my fancy, and when I feel I have something specific to say. In these circumstances, I have to write specific things at specific times and I'm not as productive in that way. I'm learning to work it through, though. From writing I get distracted very easily if something's not going the way I want it to go. I find it hard to persevere with writing, whereas with drawing I have much more patience. I think because I know I can get there with drawing, but writing - it's more linear - like if a sentence isn't working or a word isn't fitting properly, I find it hard to move on from that and then I'll go on Facebook of Tumblr or Instagram or pick at my nails or start doodling with a pen or spinning around on my new spinning chair. I digress. My friends from high school came over to my studio on Friday night and we ate so much Trippy Taco it was criminal (6 meals between three people) and then hung out watching episodes of My Strange Addiction and looking through the 1970s cookbooks my friend bought me and dry-retching at the jellied meatloaf sections, which is completely normal, and we then drove home singing/yelling along to early 2000s hit songs. It was fun. Plans for this week include working on my book in my studio and working at work. I am going to be social on Saturday and have that long awaited day off on Sunday. Oh, I made a new playlist, too. 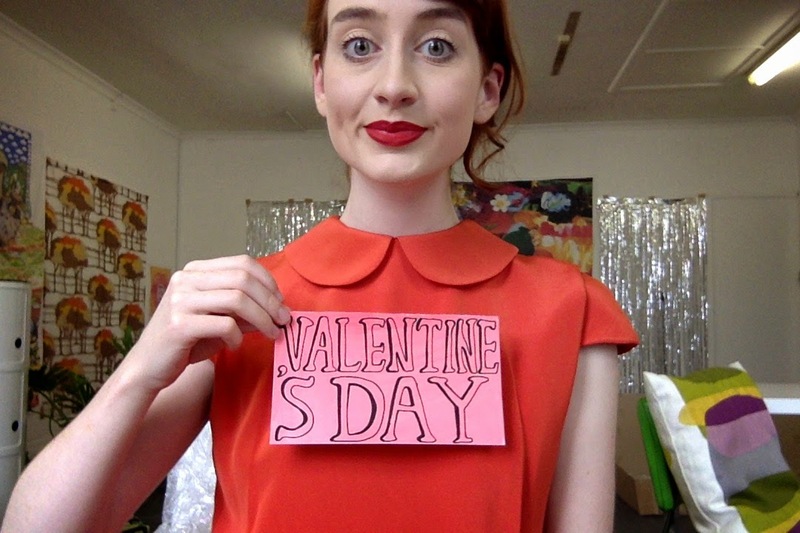 A belated Valentine's Day themed one - enjoy! Wow, I am so glad I discovered your art. It is fabulous and the colors are delicious. I am also an artist but in America (www.artonthemoon.com). I have been discovering lots of really amazing Australian artist lately. Maybe I need to visit Australia because it seems like such an inspirational place!!!! !